Overview - Robert Ford, who's idolized Jesse James since childhood, tries hard to join the reforming gang of the Missouri outlaw, but gradually becomes resentful of the bandit leader. I have a soft spot for challenging films that defy expectations to deliver truly unique experiences. One look at the 2007 Best Picture Oscar nominees tells me that the Academy is finally beginning to feel the same way. Not to undermine any of the films up for an Oscar, but my sole disappointment with this year's nominees has been the exclusion of 'The Assassination of Jesse James by the Coward Robert Ford' from a majority of the major categories. The end of the Civil War left ex-Confederate brothers Jesse (Brad Pitt) and Frank James (Sam Shepard) determined to continue their fight against the North. Within a few years, they formed a notorious gang that hit Union-owned businesses, banks, and trains, making the men legends in their own time. The film begins in 1881 as the James gang begins to disband and return to their families. Unfortunately, Jesse has a tempting price over his head, and his former friends begin conspiring behind his back. As he uncovers their deceit and punishes those intent on betraying him, a confident upstart named Robert Ford (Casey Affleck) desperately works to earn Jesse's respect. Yet to Robert's frustration, Jesse is constantly looking over his shoulder, unable to trust anyone. As the relationship between the two men takes an adversarial turn, Robert decides to take matters in his own hands and strike first. Critical hype had given me high expectations when I caught 'The Assassination of Jesse James' in theaters late last year. Unfortunately, my heart sank for the first half hour, as the film seemed to be everything I didn’t want it to be -- aimless, meandering, and temperamental. I couldn't wrap my head around the point of the story or the depiction of its characters. Even more puzzling to me was the way the film had amassed a small army of ardent fans. In my eyes, Jesse was a fuming dolt, Robert was little more than the coward suggested by the film’s title, and the James gang was an insufferable crew of uneducated screw-ups and outcasts. But at some point things changed -- the film began to explore the men hiding behind each facade. Jesse became a calculating genius wearing a mask of Tyler-Durden-esque anarchy and unhinged ruthlessness; a self-loathing family-man torn between loyalty and self preservation. Robert was revealed as a scorned dreamer looking for a place to belong; lost in the void of hero worship and the desire to be something more. The James gang was suddenly a pack of domesticated wolves, scurrying beneath Jesse's table to nab scraps on his floor; dim-witted, self interested men that unwittingly brought about their own demise. Jesse James wasn't just a good shot -- he was a skilled strategist who merged greed and talent to become one of the most notorious gunmen in history. The cast does an amazing job with every nuanced line and tick. Pitt is on fire, delivering one of the most focused and evocative performances of his career. Casey Affleck continues to upstage his older brother with an Oscar-nominated performance; his portrayal of Robert is both touching and demented, making "coward" a tragic label that doesn't do his character justice. The supporting cast is packed with solid performances as well -- Sam Rockwell, Sam Shepard, Paul Schneider, and Jeremy Renner all deliver the goods. Even minor parts make an impact -- Mary-Louise Parker is haunting as Jesse's wife, Zooey Deschanel makes the most of a late appearance, and Washington power-player James Carville even pops up to make Governor Crittenden a memorable force of vengeance. 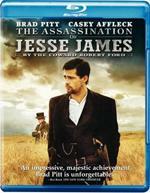 The brilliance of 'The Assassination of Jesse James by the Coward Robert Ford' is in its title. With the story's ending presented as an inevitability, my first-act boredom gave way to curiosity as I watched the gang interact. How would Robert best Jesse? How would Jesse's relationships splinter apart? What fatal error would bring about his undoing? These questions slowly gave way to an immense sense of dread as Jesse and Robert came closer to their unavoidable confrontation, and even when that moment finally arrived, it still hit me with an unexpected jolt. Despite the outcome being clear for more than two hours, the endgame unfolded in such a poignant manner that I simply never saw the events of the third act coming, and was ultimately left in stunned silence as the end credits crawled up the screen. Some people will have legitimate issues with the film -- the story develops at a slow pace, and the ending ultimately hinges on audience expectations. People looking for a traditional Western and exciting gunplay will be sorely disappointed, but those with patience and an eye for character study will be enthralled by the results. 'The Assassination of Jesse James by the Coward Robert Ford' is a remarkable film, one that I'll revisit again and again. The Blu-ray edition of 'The Assassination of Jesse James' is presented with a steady 1080p/VC-1 transfer that does the intended look of the film justice -- especially when compared to its murky, standard DVD counterpart. You may find yourself underwhelmed at first as there isn't much eye candy to be had here. Colors are muted and draped in sepia overtones that amp up the tone, but dull the pop of the picture. Black levels are deep, but darkness often functions as an impenetrable cloak that hides the intricacies of the nighttime set pieces. Detail is incredibly revealing at times, but intentional camera techniques leave many shots soft, unfocused, or distinctly warped. Even so, I would have given the video a much higher score based on its faithfulness to the filmmakers' intentions if the transfer wasn't hindered by several technical issues. First off, Warner has bizarrely crammed the 160-minute film onto a 25GB single-layer disc that simply leaves the transfer out in the cold. Compression issues continually creep into the image and I found myself confused by the lazy presentation. It doesn't help that the transfer's contrast levels are fairly average, leaving the film's beautiful cinematography looking like a flat, uninspiring series of still photographs. To top it all off, blacks sometimes crushed, whites randomly bloomed, and noise intruded on more than one occasion. Worst of all, I couldn't take my eyes of a single flaw that evolved into a constant distraction -- the picture is plagued by some of the most obvious edge enhancement I've seen on a new release. Actors occasionally look superimposed onto the screen, dark hats appear disjointed from the rest of the image, and buildings on the horizon look as if they've been etched in against the bright skies. As an experiment, I ejected the disc and trotted to our guest bedroom to see how apparent the EE would be on a small, 27" LCD screen. Sure enough, the transfer's gangly halos still stuck out like a sore thumb -- as such, it's easy to imagine how ugly the edge enhancement is on a larger screen. This is a high definition release... does it really need such an artificial boost to its clarity? All things considered, 'The Assassination of Jesse James' looks fairly good in high definition, but its flat dimensionality and offensive edge enhancement really spoil the party. After my disappointment with the film's transfer, I was relieved that the rather basic Dolby Digital 5.1 surround track (640 kbps) turned out to be a competent attribute of this release. Dialogue is crisp and well prioritized, pans are swift and transparent, and the rear channels provide a lot of subtle ambiance to the outdoor environments. Interiors sound great as well -- echoes and acoustics are natural and its very clear that the designers injected a lot of detail into the soundscape. Dynamics snap to attention when called upon with strong LFE support and stable treble tones. The overall experience may not have thumped my chest, but it drew me in and allowed me to easily immerse myself in the on-screen world. If I have any complaint, it's that gunshots are a bit hit-or-miss (pardon the pun). Some bullets pack a tremendous punch, while other similar firearms sound weak. I would attribute it to historical accuracy, but Jesse's gun sounds decidedly different even when its fired in the same environment. But don't get me wrong, this minor hiccup certainly won't hinder the track for anyone but the most stringent audiophiles. Honestly, this is one of the few reviews where I didn't yearn for a lossless track. Aside from the obvious boost in fidelity, I doubt a TrueHD upgrade would have significantly increased the impact of this particular film. This is a quiet track that unfolds as softly as the story -- fans may balk at its lower bitrate, but the mix does its job and does it well. The standard DVD release of 'The Assassination of Jesse James by the Coward Robert Ford' doesn't include any special features. Despite the missed opportunity for a fascinating commentary, Warner has at least seen fit to include an exclusive documentary on the Blu-ray release. 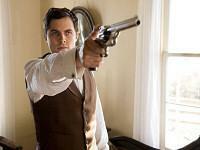 'The Assassination of Jesse James by the Coward Robert Ford" is a challenging film. The acting is superb, the script is surprising, and the film has an undeniable sense of doom that keeps the story compelling. Sadly, this Blu-ray release is a mixed bag. While it features a great audio track, it has to rely on a troublesome transfer and a lack of real supplemental meat. This is a no-brainer for fans, as it bests the DVD in every way. However, newcomers should definitely approach with caution before blind buying this buzz-worthy film.